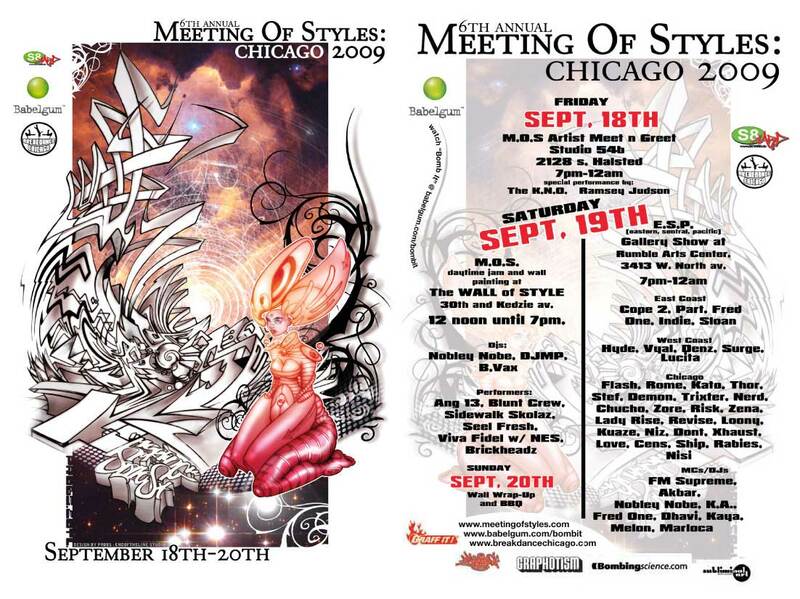 Meeting of Styles 2009 in Chicago. I’ll be painting a wall with the crew. The Three Hearts Club as part of this years annual International “Meeting Of Styles” graffiti art exposition. Rumble Arts Center is proud to announce it will be hosting Eastern, Sentral, & Pacific, a tri-costal graffiti art showcase that is in its fourth year of production. This art exhibit features over 30 of the most renowned graffiti artists from, Chicago, New York, San Francisco, Los Angeles, Philadelphia, Japan, and Puerto Rico. The gallery event coincides with the world wide graffiti mural tour Meeting of Styles, which originated in Germany ten years ago and makes its way around the globe every year. This year we plan to include local MC’s and DJ’s from New York and Chicago as part of the opening festivities. This event is a family oriented, multi-generational, cultural event that has attracted over 800 people every year, and we hope to reach 1,000 this year.